Inspired by the adorable white pumpkins with gold dots at Lilikoi Joy, I spray painted our mini pumpkin gold, lightly brushed the stem with white paint, and helped my daughter dip the end of the paintbrush into the paint to randomly dot our gold mini. Alas, this pumpkin will not stay forever, as Frost has said: "Nothing gold can stay." Still, for the time it is here, we welcome the autumnal air. I am a big fan of glitz, so your glamorous pumpkin is right up my alley! :) Thanks for linking it up at our Fall Party! :) I am so glad you like it and that my daughter could make it with me! The shout out was more than well-deserved! This is awesome! Love the "bling" this adds! Super cute! So glam! It's great. Thanks for linking up to the Pumpkin Parade. Thank you, Kelly. :) It was such fun to see what everyone thought up! So easy but so cute. Great idea. adorable! i love the white polka dots on it! Yeah for the pumpkin parade AND the monthly challenge! Thanks for playing along. Love the polka dots and of course the gold pumpkin! It turned out beautiful! =D Is it fair to use the same little project for both? :) Thank you for allowing others to play along; it's nice to be apart of something bigger than my own list of projects! I just adore the gold pumpkin and the dots add the perfect touch! 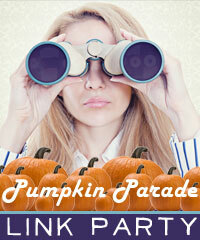 Thanks for linking up to the Pumpkin Parade. Thank you for your kind comment and for hosting the pumpkin parade! What a fun pumpkin! Thank you for linking up to my furniture and paint party. I LOVE the look of the gold pumpkins and the white polka dots are a fun added touch! !